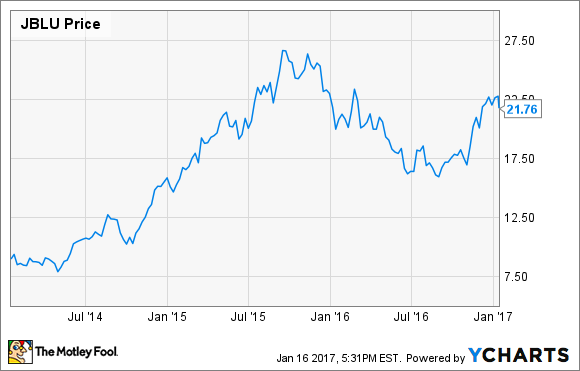 With unit revenue comparisons about to get a lot easier and plenty of profit growth initiatives in the works, JetBlue could be a great stock to own in 2017. After spending many years out of favor with investors, JetBlue Airways (NASDAQ:JBLU) became a market darling again a few years ago. Between the beginning of 2014 and September 2015, JetBlue stock more than tripled. However, it has lost some of its luster since then. JetBlue Airways Stock Performance, data by YCharts. A sharp slowdown in JetBlue's unit revenue performance held its stock back throughout 2016. However, JetBlue is poised for a return to unit revenue growth in early 2017. Moreover, it will benefit from several long-term earnings growth drivers over the next few years. As a result, JetBlue stock could soar to new heights in 2017. During 2015, JetBlue outperformed its rivals in terms of unit revenue. For the full year, revenue per available seat mile (RASM) increased 0.8% at JetBlue. Even in Q4, the carrier posted just a modest 0.2% RASM decline. However, JetBlue's unit revenue trajectory quickly went south in 2016 as the carrier added too much capacity and demand for many of its routes to Latin America sank. During the first half of 2016, RASM plunged 7.6% year over year. Since then, JetBlue has reduced its capacity growth, particularly in weaker markets. JetBlue plans to continue that capacity discipline in 2017, growing its available seat miles 6.5%-8.5% year over year, compared to 12.6% growth in the first half of last year. JetBlue has slowed its growth since the middle of 2016. Image source: JetBlue Airways. Slower capacity growth is already leading to better unit revenue results. RASM was roughly flat year over year in November and declined by about 1.5% in December. JetBlue's year-over-year unit revenue comparisons are about to get a lot easier as the company laps the big declines experienced during the first half of 2016. Furthermore, demand is starting to improve in Latin America. As a result, RASM could return to strong growth this year. Right now, analysts are only expecting 1%-2% RASM growth at JetBlue for the full year. If JetBlue blows past these estimates, the stock could gain ground in a hurry. Looking a little further ahead, the expansion of JetBlue's premium "Mint" service should drive additional unit revenue growth over the next few years. Whereas most JetBlue planes are set up in an all-coach configuration, Mint-equipped planes have a premium cabin with 16 lie-flat seats. Customers in the Mint cabin also get a variety of other perks and higher-touch service. Business travelers and well-heeled leisure travelers have been willing to pay high fares for JetBlue's Mint product on transcontinental routes. As a result, the company decided last year to upgrade a slew of routes to Mint service in the near future. In 2017 alone, JetBlue will nearly double the size of the Mint fleet, from 17 planes to 31 planes. However, most of those planes will come in the second half of the year. As a result, JetBlue's Mint expansion will really take off in the fourth quarter. The rollout of new Mint service should drive an increase in the average fare on those routes, boosting RASM in late 2017 and into 2018. JetBlue plans to add Mint service to numerous routes later this year. Image source: JetBlue Airways. While the expansion of Mint should drive unit revenue growth beyond 2017, JetBlue is also focused on holding down unit costs. At its investor day last month, the company described a variety of initiatives designed to improve productivity and reduce structural costs. JetBlue expects its total annual savings to reach $250 million-$300 million by 2020. JetBlue will also add 12 seats to each of its more than 100 A320 aircraft starting later this year. This will reduce the cost per seat of operating each plane. Lastly, JetBlue is scheduled to add dozens of fuel-efficient A321neo airplanes to its fleet beginning in late 2018. Some of these planes may be converted to a long-range variant and used to begin service to Europe. But others will be taken in a 200 seat all-coach configuration, which would drive a significant reduction in JetBlue's unit costs. JetBlue Airways is a dynamic growth company with a high profit margin and massive long-term potential. The carrier has plenty of room left for growth in the U.S. along with big international growth opportunities. Nevertheless, JetBlue stock trades for just 10 times the company's 2016 earnings. Once JetBlue's unit revenue performance gets back on track -- which will probably be very soon -- the stock could start to rally again.